The remanufacturing technology of aero-engine blade is one of the effective ways to save expensive materials such as titanium alloy, make full use of resources, and solve the problem of resource hiding. Laser-cladding technology has been widely used in the remanufacturing of blades due to its ability to fabricate high-performance alloy surfaces on metal substrates without affecting the properties of the matrix. In order to solve the problem that the grinding precision is difficult to guarantee due to the deformation and residual distribution of the blade in laser cladding remanufacturing, the self-adaptive grinding process of abrasive belt is repaired based on online inspection and reconstruction model. Firstly, the distribution of theoretical measuring points is planned based on the curvature of cross-section curve, and then the theoretical measurement points are adaptively extracted according to the improved firefly algorithm, so that the CMM measurement path planning of laser cladding and remanufacturing blades is realized. Taking the layer as the unit, the measurement data are processed, and the iterative nearest point algorithm is used for data registration to realize the laser-cladding remanufacturing blade measurement data processing. On this basis, the blade surface model is obtained based on NURBS interpolation. Finally, a laser cladding and remanufacturing blade of an aero-engine was tested. The experimental results show that the blade surface roughness is 0.4 μm, the blade edge accuracy is less than 0.05 mm, and the blade edge error is less than 10%. 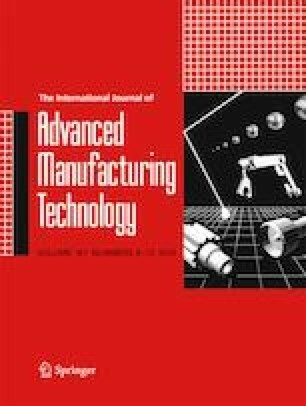 The experimental results show that this method can effectively solve the grinding process of laser-cladding remanufacturing blade. This work was supported by the National Natural Science Foundation of China (grant no. 51705047), the Technological Innovation and Application Demonstration of Chongqing (cstc2018jszx-cyzdX0061), the Fundamental Research Funds for the Central Universities (2018CDQYCD0038), and the major projects of aero-engines and gas turbines (2-2017-VII-0002).